Daily Jang Newspaper 20/02/2018 has announced 65 New Jobs in Pakistan Railway 2018 in Lahore Division. 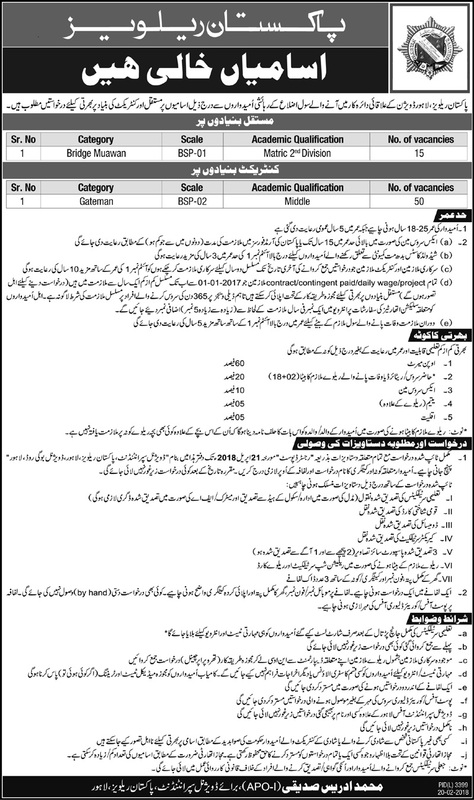 Candidates who desire to be job in Pakistan Railway can apply for the post of Bridge Assistant on Permanent Basis and Gateman on Contract Basis. Applicants meeting the required Criteria may apply for these jobs by sending their applications along with all attested necessary Documents to Divisional Superintendent, Pakistan Railways, Lahore Divisional Bogi road Lahore before last date.